Need some ideas for the best lesbian engagement gifts to celebrate the future Mrs. and Mrs? We’ve got you covered with 10 fabulous gifts that they’ll absolutely love! So, your favorite lesbian couple finally got engaged, huh? How absolutely cool is that? Now comes the tough part of figuring out what to get them for an engagement gift. Well, not a problem because we have you covered! Here are some of the best lesbian engagement gifts! 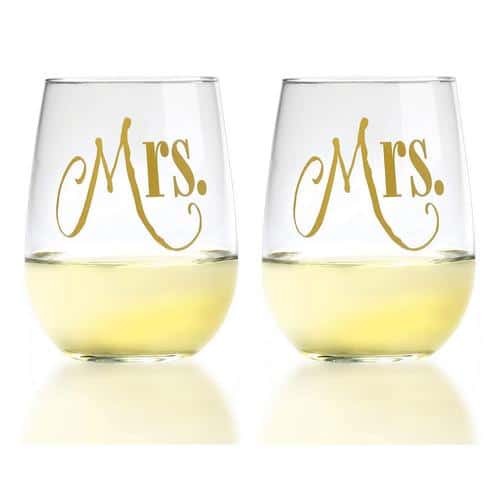 This set of 2 stemless Wine Glasses feature the wording “Mrs.” on each glass, in rich metallic gold lettering. Each glass measures 4.5-inches tall, 3.5-inches wide and holds 17 ounces. The glassware itself is restaurant quality, and the design is permanent. The stemless design also makes them perfect for juice, so these aren’t just for brides who drink wine. The heart is a chalkboard, so your favorite couple can update it daily. You can also request customization and put names on the sign itself. The entire sign is completely handmade, so it’s really a one-of-a-kind item. This set of 2 Mrs. & Mrs. 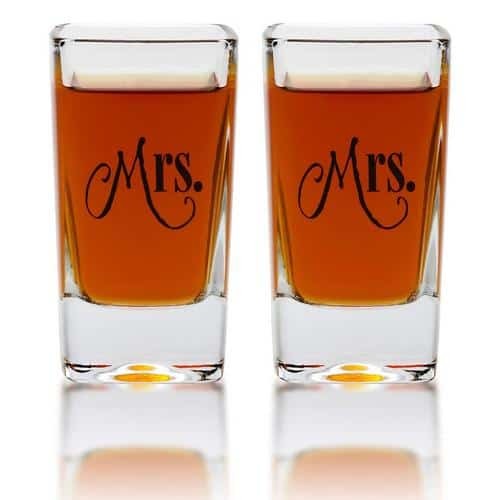 Shot Glasses make the ideal engagement gift for brides who are the life of the party! Each shot glass measures 3.25-inches tall and holds 2.8 ounces. 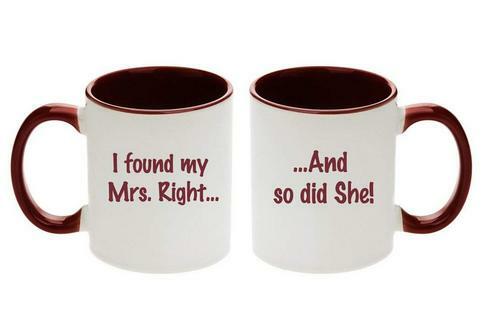 Each one features an elegant “Mrs.” design and they are dishwasher safe. The design is permanent and won’t wash off. This set of 2 coffee mugs feature a dark red color interior and exterior lettering. Each coffee mug comes in its own individual white gift box. Hear me out, because I know can coolers don’t really sound like a great engagement gift. These are different, though! They’re super cute and classy! This set of 2 coolers comes in 4 different color options- blush and dark blue, mint and dark blue, white and black or white and dark blue. 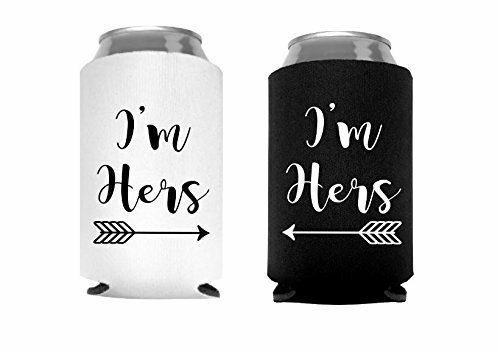 Each of the can coolers reads: “I’m Hers,” with an arrow pointing in opposite directions. These can coolers can collapse to lay flat, making for easy transporting. 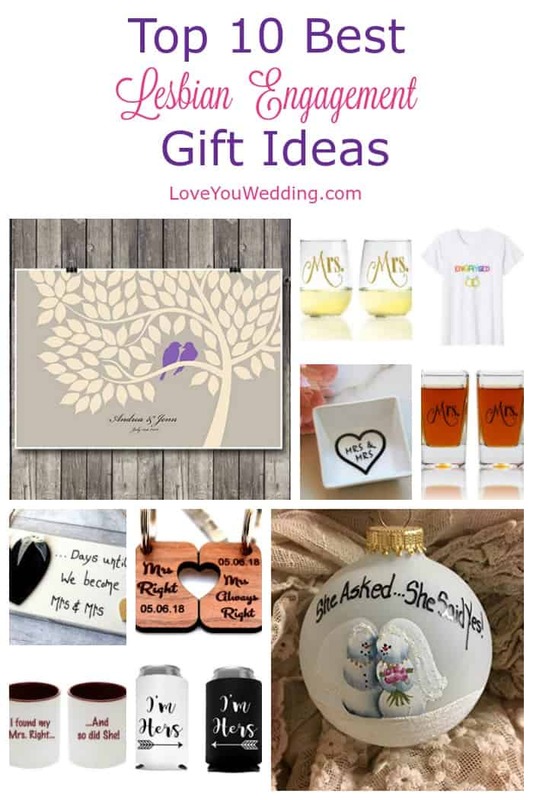 Want to give your favorite couple a gift they can use at their wedding? I love this signing tree ! It’s such a clever idea and one of my all-time favorite lesbian engagement gifts! 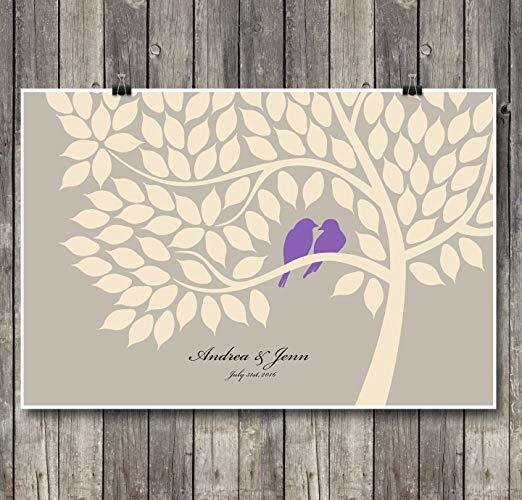 The poster can be personalized with the couple’s names. It features 75 “signing leaves” and comes with an instruction card. Guests sign their names using the included fast-drying ink markers. 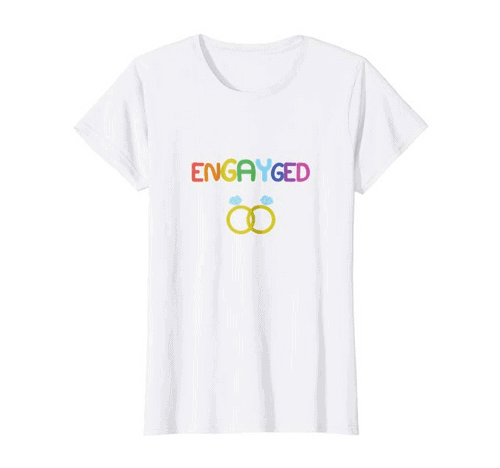 This 100% cotton t-shirt reads: “ENGAYGED,” in rainbow colored lettering and features an image of two engagement rings. The t-shirt is available in 5 different colors- cranberry, Kelly green, pink, purple and white. Grab one for each of the brides-to-be! 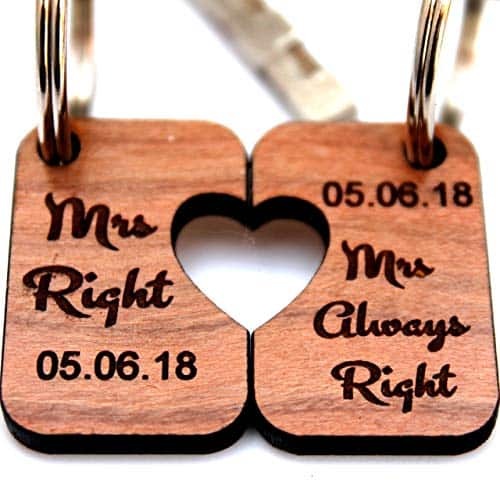 This set of 2 wooden keychains are another one of my favorite lesbian engagement gifts. 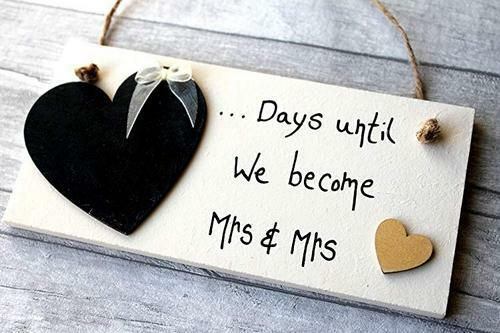 The are handmade and can be personalized with the wedding date. The two fit together to form a heart. Each set is handmade to order. 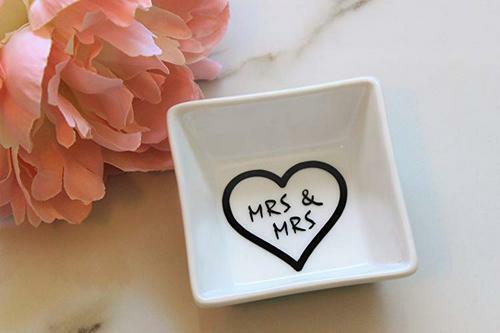 This white porcelain ring dish features the wording: “Mrs. & Mrs.,” surrounded by a heart in black glossy adhesive vinyl. The ring dish measures 3-inches by 3-inches and is 1.25-inches deep. It’s deep enough to hold two rings safe and sound. 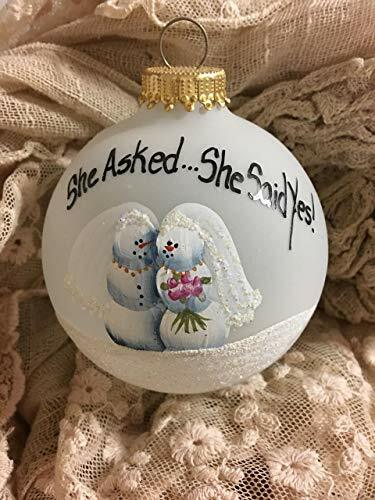 There are some gorgeous Christmas ornaments that would make beautiful lesbian engagement gifts. My favorite is the one pictured above. It reads: She asked…She Said Yes! The ornament is handmade with love (and without stencils), making each one completely unique. These are just some of my favorite lesbian engagement gifts. They’re fun and meaningful gifts with a little something for every personality! What are your favorite lesbian engagement gifts to give? Tell us below!